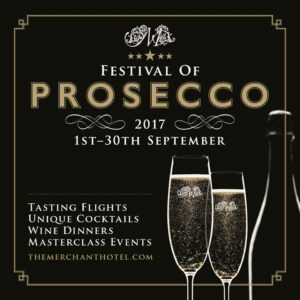 Our single vineyard Artisan quality, hand harvested Montagner Prosecco will be show cased by The Merchant Hotel in September 2017 for their month long Festival of Prosecco. The hotel will be featuring the three different quality levels of Prosecco supplied to them by GreatVine up to Cartizze level, which is the Grand Cru of Prosecco and rarely found outside of Italy. Guests will be able to learn all about their favourite bubbles and get educated on how to identify a good quality Prosecco. Understanding how Prosecco is made will inform guests that it’s a wine which needs to be consumed young and fresh, preferably within the year of vintage. However, therein lies quite a problem in the UK export market, as the vintage is usually not stated on the labels unless it’s a ‘Millesimato’ Prosecco where the producer is obliged to put the year of vintage on the rear label. As importers have to pay extra to buy a ‘Millesimato’ Prosecco, it’s unusual to find one on the shelves of your local supermarket or wine shop. In many hospitality venues, it’s also unusual to find a ‘Millesimato’ Prosecco. 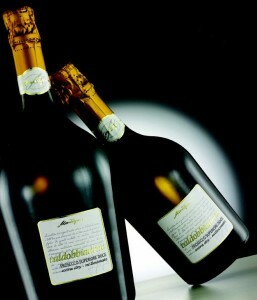 Only through educating the Prosecco consumer, will enough pressure be applied to encourage more stockists, hotels, and restaurants to stock a better quality product. Some even sell a standard unclassified Spumante wine as Prosecco, so it’s always worth knowing what you’re buying and demanding the best for your hard earned cash. Taste your way through five selected drinks and understand the ‘prosecco process.’ Enjoy Cicchetti for each table towards the end of the event. 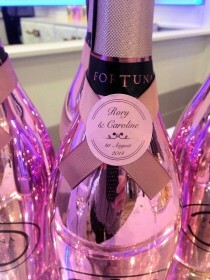 Enjoy a night of music and bubbles on the roof garden! GreatVine will be in attendance to welcome guests and talk about all things Prosecco. Enjoy Cicchetti for each table towards the end of the event and live Italian guitar music from musician Luigi Cirillo.